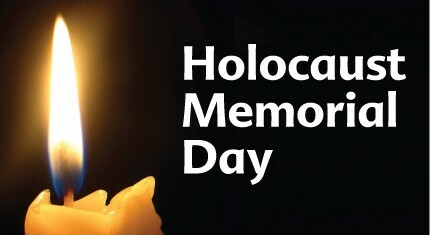 The 2019 theme for United Nations Holocaust Memorial Day was “Holocaust Remembrance: Demand and Defend Your Human Rights”. At a time when the spread of Neo-Nazism and hate groups is fueling rising anti-semitism and other forms of hatred around the world, this theme encourages youth to learn from the lessons of the Holocaust, act against discrimination, and defend democratic values in their communities. The theme highlights the 70th anniversary of the Universal Declaration of Human Rights and the Convention on the Prevention and Punishment of the Crime of Genocide. The theme of this year’s event, “Holocaust Remembrance: Defend Your Human Rights”was the thread that ran through the remarks of the following speakers: UN Secretary-General Antonio Guterres, Maria Fernanda Espinosa Garces, President of the United Nations General Assembly; Danny Danon, Permanent Representative of Israel; Jonathan R. Cohen, Charge’ d’ Affaires, US Mission to the United Nations. Anti-semitism is gaining in intensity. Neo Nazism is proliferating and encouraging young people. 28% of Jewish people have experienced some form of anti-semitism just because they’re Jewish. Pillars of humanity are weakened and no one is safe when there is anti-semitism. As the numbers dwindle, it is our responsibility to the survivors to make sure their stories are told, especially to school children all over the world. Apathy and indifference are more dangerous than hatred. You can’t fight it. When indifference is turned off by entire societies, millions suffer. Israel is embracing a new era. They are alive, they are strong, they are determined and here to stay. Who will tell the story of the Holocaust and keep it alive? We will. A racially mixed choir from School 22 in NYC, raised their voices in hope to remind us that we can all live in harmony. The music and lyrics were written especially for them by the next speaker, survivor, Inge Auerbacher. Ms. Auerbacher told her story of being a child survivor of the Holocaust. She spent years in Terezin and was liberated by the Soviets in May, 1945. While a child prisoner, their most important words were bread, potatoes, soup. She emphasized that the antidote to hate is education. Mr. Marian Turski born 1926 in Poland told his story in a unique way – even those of us who have been to many Holocaust Memorial ceremonies had never heard anything like it. When asked what was the worst thing about Auschwitz he replies that hunger, cold, living conditions, lice are all awful but the worst thing is humiliation. We must learn empathy and compassion to avoid another Holocaust. When a leader has only one idea, beware! The indifference of most and collaboration of many led to the Holocaust. We must stop exploiting the Holocaust as a political thing; Holocaust denial must be stopped as well. All societies are fragile, especially in times of great change. Mr. Sandro De Bernardin, Chair of the international Holocaust Remembrance Alliance, spoke of the need for education. His organization was started 20 years ago in the face of growing ignorance of the Holocaust. The IHRA works against distortion of the Holocaust and is studying all countries in Europe which had racial laws in the 1930s and 1940s. Not one Jewish life was lost in Albania during WWII. In fact, there were ten times more Jews in that small country after the Holocaust than at the beginning of the war. How was that possible, you may ask, when millions of Jewish lives were lost in other European countries? The speakers at today’s briefing were Jewish Albanians whose lives were saved, Albanians whose families saved lives, children of survivors, distinguished diplomats. Using some excellent film clips they explained the amazing, unknown story of the Jews of Albania. The facts were buried until recently because a dictator ruled the country for 49 years after the war, and all the documents and stories were concealed. What made the Albanian people risk their lives with their courageous acts when others in Europe stripped the Jews of their human rights and worse, their lives? “BESA….The Promise” is the moral pledge of honor that Muslim Albanians are obliged to live by. Their homes belong to God and their Guests! Guests are NOT treated as foreigners but family members so the Albanians had Jews move right in to share food and even bedrooms. Entire villages knew of Jewish families hidden among them but no one turned them in. In fact, the Albanians today are surprised by the fuss being made about what they did when they were just doing their duty. It’s a story of humility and humanity and one that deserves the attention of the world during this wretched time of populism and xenophobia. One young Jewish man, a recent college graduate, has found a poignant way to honor his four grandparents who were survivors of the Holocaust. He started an initiative entitled “Together We Remember” where young people all over the globe are encouraged to prepare events to pay homage to victims of their particular genocide. Today’s UN program was presented by the UN Department of Global Communications, the Permanent Mission of Albania and the World Jewish Congress. At an event with many powerful moments, one that left a significant impression came from the Permanent Representative of Austria who said, as the program was drawing to a close, that he was ASHAMED of what his countrymen did to their Jewish population during the Holocaust! As part of the Holocaust Remembrance Day, an exhibition followed at the United Nations lobby after the conference: “Beyond Duty: Diplomats Recognized as Righteous Among the Nations“, sponsored by Portugal, Perú, Yad Vashem, and Israel. 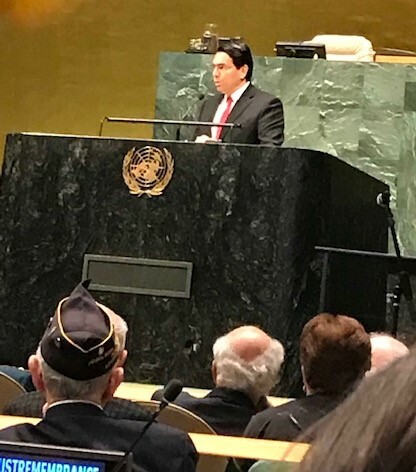 Among the speakers, were UN Secretary-General Antonio Guterres and Danny Danon, Israel’s Ambassador to the UN, as well close relatives of two of the diplomats honored. The exhibition showed many more. It tells the unique stories of diplomats who recognized the danger and murder the Jews were facing from the Nazis. They chose to act according to their conscience and tried to save as many Jewish men, women and children as possible, issuing them passports, visas and travel permits. We heard about Consul José María Barreto from Perú, who was convinced that by his highly human deed he could save a number of people. He was stationed in Geneva and saved 58 Jews, including 14 children by issuing passports and visas. Unfortunately, some were canceled when the Government of Perú was informed about it. He was fired, as we learned from the stories told by his grandson. Arístides de Souza Mendes, from Portugal, Consul-General in the French city of Bordeaux, issued a number of visas and passports to refugees, defied Salazar’s regime, for which he was punished with one year of inactivity, but as he said “I would rather stand with God against man than with man against God”. His grandson and a niece gave testimonies of his life. It was a very touching exhibition, showing the good will of so many people who understood the gravity of the time and assumed their responsibility to save lives in spite of the consequences.